One of the best services the Washington County Cooperative Library Services (WCCLS) offers is the shared library collection that all patrons have access to. Did you know that through the WCCLS system, our 263,000+ library card holders have access to over 1.6 million books and other materials? That’s the equivalent of about five Beaverton Main Library collections. In addition to the shared library collection WCCLS and its 15 member libraries offer 375 public access computers and free WiFi that people use for job searches, email communication, checking in with the home office, studying for job exams, or completing online courses. Member libraries offer technology assistance for all members of our community. Examples of learning opportunities include library workshops (resume writing, computer skills), research databases and online tools such as Oregon Career Information System, Learning Express Library, Reference USA. And with WCCLS member libraries open up to 359 days per year they also offer access to meeting space – free, safe, neutral public space for meeting with clients or study groups or doing market research. The same can be said for the monthly offering of hundreds of literary, career and cultural programs presented throughout the WCCLS member libraries. From visits by Acclaimed Authors to learning the Basics of Going Solar or hands-on assistance with Computer Skill Development – there is sure to be a local library-based program or service that will meet the interests of the nearly 3.9 million visitors our libraries welcome each year. These are just a few of the reasons why maintaining resources for job-seekers and expanding the purchase of books, e-books and other materials are a core-component within Measure 34-235 – the replacement levy for countywide library services on the November 3 ballot (www.wccls.org/levy). Following is a brief sample of upcoming programs and services designed for the adults in our communities. Additional services can be found on the libraries events calendar (www.wccls.org/calendar). Seismic Retrofitting: Sat., Oct. 24, 1- 3 p.m. Learn the basics of installing a residential seismic retrofit. Encore Entrepreneurship: Wed., Oct. 28, 6 p.m. Turn your professional experience or hobby into an encore career! Basics of Going Solar: Sun., Oct. 25, 2 p.m. Presented by Solar Oregon and Energy Trust of Oregon. Registration required. Open Computer Lab: Thurs., weekly, 9 - 10 a.m. Drop by for help with your tablet, downloading e-books and more. 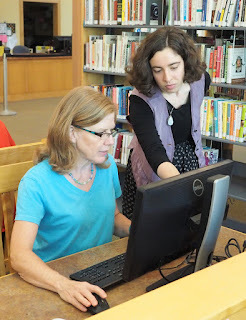 Computer Help (Bilingual): Wed., weekly, 5:30 p.m. Computer help on library computers or yours. Writing Workshop with Writers in the Grove: 2nd Sat., monthly, 10:30 a.m. Designed for all experience levels. Writers’ Group: 1st Thurs., monthly, 6:30 p.m. Share your writing projects and receive feedback from peers. Can I Recycle That? Recycling and Sustainability: Wed., Nov. 4, 6:30 - 8 p.m. Reduce, reuse and lighten your footprint. Classical Guitarist Peter Fletcher: Tues., Oct. 27, 7:30 p.m. Diverse music program including Bach’s Third Lute Suite and more. Crazy 8s Author Tour: Thurs., Nov. 5, 7 p.m. Eight published Oregon authors speak for eight minutes each. Enjoy this engaging and fast-paced event. Hillsboro READS: Series of October events surrounding author Harper Lee’s books To Kill a Mockingbird (and film screenings), Go Set a Watchman; author Marja Mills The Mockingbird Next Door. Holocaust Remembrance on the 77th Anniversary of Kristallnacht: Mon., Nov. 9, 7 – 8:30 p.m. Witness local Holocaust survivors speak about experiences under Nazi persecution. Soup and Books: Thurs., Oct. 29, 6:30 - 8 p.m. Author Maggie Stuckey discusses books as we enjoy free soup from New Seasons. Exit Wounds: Soldiers’ Stories – Life after Iraq and Afghanistan: Sat., Nov. 14, 2 p.m. Book of 50 oral histories will be discussed by the author. For additional information about Measure 34-235 please visit www.wccls.org/levy.